Revolutionary? No. Life Changing? Possibly not. Time consuming because all I do now is see other peoples beautiful books on Pinterest and Instagram and I want it all?! How did you know? Yeah, I’ve seen bullet journals slowly invade over every social media site I use and it didn’t bother me. I knew it wasn’t for me. I wouldn’t be able to keep up with doing that everyday, let alone make it look pretty. But then the temptation got too strong, and I found myself purchasing the coveted Leuchturrm. Bare in mind I made this purchase mid-end January, but I felt I would rather fill it in from the 1st, cause ya’ know consistency. Honestly it would bug me so much if it only ran Feb-Dec. So after searching around for the best ways to start a bullet journal, I made a wonderful year at a glance spread and then worked on the back-log of January. 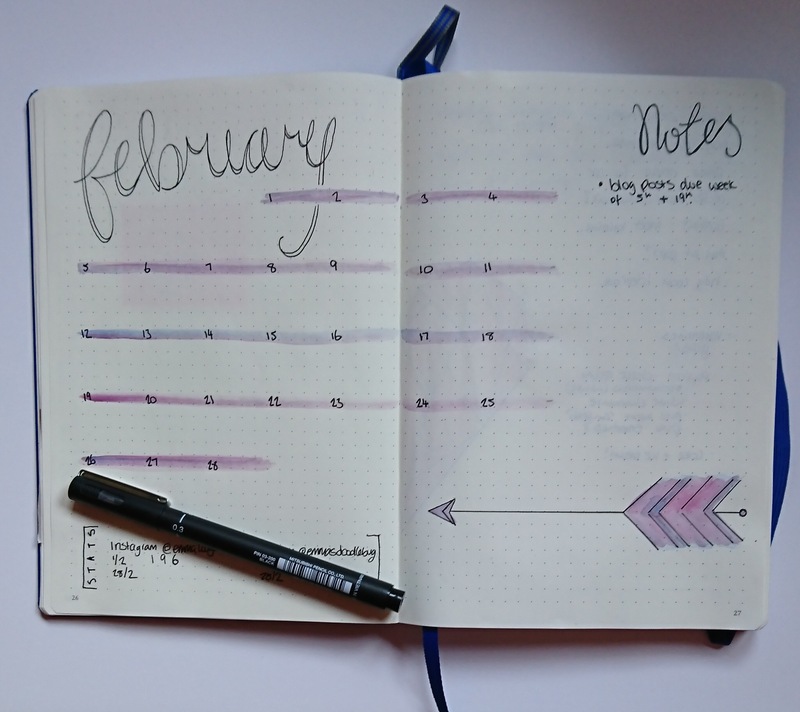 This did give me the chance to test out some weekly spreads and how much doodling/’prettifying’ I could reasonably do. Now we are in February and I’m not gonna lie, I set up for the whole month at the start. I knew that I had an hour or so to just focus on getting some watercolour sketches down, and that decorating ahead was the only way that my bullet journal wouldn’t become an ugly duckling for the month. While these pages are looking very fitting for Valentines (so cliche I know) I did condense down the space used for my weekly spreads. I learnt in January, that while having all that space looks nice, it is just wasted with me. I’m only a month in and I’m already realising that the pretty journal set ups I’ve been oogling at on Pinterest are just not going to work for me. I am beginning to wonder if the key is in simplicity in a few months I’ll share another update (so long as I’m still using it and haven’t lost it) with it being Valentines next week, Ive also been playing around with some more handmade cards. Honestly you get The Best patterned papers for valentines and I wanted to use them all. Eventually I managed to narrow down my choices and colour options and this was the result. I can’t share too much about valentines as I’ve got to keep some stuff a surprise for prying eyes.